Youthful summers away from home doing chores on farms, construction work, truck driver, and two rounds of the Iditarod (the Alaskan dog sled race); provided Gary Paulsen with sufficient material to write powerful stories. Paulsen has a way of intertwining his real life experiences into his novels. Allowing the reader to experience first hand his accounts of self discovery through adventure and conflict. 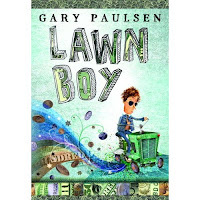 Lawn Boy is Gary Paulsen’s newest book, published earlier this year. This book is about a teen boy’s needs for a new tire for his bike. He decides to use the old lawnmower that his Grandmother gave him for his birthday to start mowing lawns. Along the way he accepts the help of Arnold, a stockbroker, who takes care of the money and invests it in many things including a prizefighter named Joey Pow. This is when his summer gets interesting. Harris and Me is also about a young boy and how he spends his summer vacation. In this novel a young boy is sent to live with his aunt and uncle on their farm. This boy has lived many places over the years, due to his parents drinking, but nothing quite like farm life. Harris and his cousin spend their days wrestling pigs, catching mice, and jumping from the barn, and if they can survive they might just make it through the summer. One way that Paulsen is able to give the reader this first hand experience in both of these novels is that he allows the reader to become the main character. Both of these books, written 13 years apart, have a nameless main character, something unusual for Gary Paulsen and his writing. These nameless characters allows the reader to jump in and experience exactly what that character is going through. At one point during Lawn Boy, the young boy is confronted by a competing lawn care company and Gary writes in such a way that you feel uncomfortable when the situation escalates and Joe Pow confronts them. The same is true in Harris and Me when you feel the excitement when Harris and his cousin are playing war and start to wrestle the pigs. Gary creates these characters that you feel connected to because you are reading it through their point of view. Even though these two books share commonalities among them, the characters and themes are very different. In Lawn Boy we live the life of a young suburban boy with stable parents who simply spends his time mowing lawns and becomes wealthy because of his investments. In Harris and Me we get to examine the life of a young boy who does not have very stable parents and spends the summer using his imagination to build a bond with his cousin Harris. Although both characters have lived very different lives you are still able to feel for each of them. At points in both novels you find yourself deeply drawn to each character and truly care about them. In Lawn Boy you learn how one young boy invests his money to create a more comfortable life at home. His discovery is one of business sense and the accomplishment of starting something from nothing. The same is not true in Harris and Me, where Harris’s cousin finds a sense of self and is able to form an actual connection with another person. His investment is personal and he finds something inside himself that he has never felt before. This connection is something that is missing in his life and he greatly appreciates what Harris and his family has done for him. The other major difference that you can pick up through these two novels is the backdrop. In one novel you see how the setting creates the experience and in the other you need to use your imagination to create a life of your own. In Harris and Me you are transported to the country life of living on a farm, and watching movies in the backroom of a bar. Although Harris and his family live comfortably, they have very little experience in life outside of their little community. Lawn Boy takes place in a suburban town where the boy lives comfortable but feels the need to help his parents out by making money to help pay bills. The experiences in Lawn Boy are created by this backdrop of the suburban neighborhood and how a boy can seek adventure and conflict in unexpected places. On the other hand, Harris and Me, examines the same themes but the experiences are true for what life is like in a small farming community. There is no money to be made its about a simple life and using your imagination to create the experiences that will last a lifetime. Both of these boys will remember there completely different summers for the rest of their lives. Gary Paulsen’s unstable childhood coupled with his sense of adventure have created a great foundation for incredible novels for young readers. As evident in Lawn Boy and Harris and Me you are able to see that sense of real life experiences intertwined with the journey of two young boys to build bonds and find their way. It took many different circumstances for Gary to find his way to writing and he shares that experience with his readers in his novels. If your looking for a wonderful rags to riches story with plenty of humor and colorful characters then Lawn Boy is for you. If you want to experience adventures as wild as boyhood imaginations and a heartwarming story then you might want to read Harris and Me. However, would we even be able to experience either of these novels if it wasn’t for a librarian offering one simple card to a boy who was seeking some warmth?